Here is another snapshot of two of our hard working Area Councils, this time Gold Coast and Peninsula. Being a mother of two, working 0.8 and heavily involved, there are times when I think "I just can't do it anymore!" Then I think about all the wonderful opportunities the QTU has provided me and ALL teachers and I feel it is my duty to give back. Supportive members keep me going; my advice to new reps is “get more people behind you. Many hands make light work”. I’m proud to support the QTU on polling booths, Labour Day marches, being on several committees, but the thing I am most proud of is my work around women's empowerment. I became a Union Rep four years ago to increase my understanding of our working conditions and entitlements. My colleagues and I were not clearly informed about current issues in the workplace and we now feel that we can have a voice and make changes for the future. Every time we sign up a new member is a proud moment for me as a QTU Rep. The Union is only as strong as its members, and the Gold Coast is notorious for its lower membership rates. Being on Area Council allows me to provide members at my school with both a local and broader perspective. In addition, meetings always produce powerful discussion and I am proud of the motions that we have presented to Executive and State Council. I started teaching in 1989 and became a rep in 2010, I believe being a Teacher Librarian offers a unique industrial perspective. I belong to the GCAC to highlight local issues and to inform members at school and branch level. I am a representative on the GCAC to provide a school leadership perspective on current educational trends and issues impacting on the Gold Coast, and because Jodie (Jodie Walsh, QTU Gold Coast Organiser) told me to! I am a representative on GCAC because I wanted to become more involved. I believe the best way to learn more is to be actively involved. My proudest moment of QTU activism was recently moving a motion to secure equitable access to NCT hours for primary and secondary school teachers. I manage my time as a QTU Rep by relying on the amazing team of reps here at Benowa (Nina Holland, Matt Pickersgill, Fiona Ballinger, Ado Comiskey, James Tucker, Adrian Hays & Reza Aumeerally). We share the load and as I’m Benowa’s newest rep, the others mentor me. I’ve worked in several schools both here and overseas. I love learning and promoting the profession. Participating in Area and State Council is inspiring. It will be interesting adding “mother” to my list of duties. I can think of many significant moments as a school-based Rep, but I’d like to mention my fellow Rep Kim Harvison, who this year initiated and facilitated the introduction of a breastfeeding room and provision for related considerations in our school which had previously made no formal allowances in this area. I was QTU proud when a new deputy to our school congratulated me on the friendly and productive tone of our LCC meetings. This is the result of many years of work and felt like a true accomplishment. My teaching expertise lies in the field of early childhood and Indigenous education. My primary motivation in applying for a position on the Area Council was that I liked to be informed of the broader issues relevant to Far North Queensland, and in particular with teachers working in the remote areas. The schools I have worked in had significantly high enrolments of Aboriginal and Torres Strait Islander students from remote communities, and as such I felt it was important to connect with and share my knowledge, experiences and beliefs from an Aboriginal perspective. One of the best decisions of my life! I became involved in the QTU as a school principal in my early small school teaching principal days. I found the QTU was a great source of support and networking for isolated school principals who were new to the role. Now, as a principal of a large primary school, the QTU is often my first point of call when I require information or guidance. As a Principal QTU Rep, my role is to ensure principals continue to be supported by both the QTU and EQ, while also hearing the important voices of classroom teachers and concerns they may be experiencing. As a member of the Peninsula Area Council, I have a forum to challenge policy and to drive reform to ensure the working and living conditions, especially those in remote areas, continue to improve and reflect the professional nature of our organisation. As a principal, there are two major initiatives that are critical for members at the moment – workload, and the Promotional Positions Classification Review. As a Principal QTU Rep and member of PAC, I work closely with our members to ensure they are fully informed and aware of progress around these issues. My QTU story began in my first year of teaching. Living in a remote context meant that every aspect of my life was impacted by battles fought and won by the QTU. The RAIS incentive scheme, teaching conditions and the standard of the house I was residing in, I had the QTU to thank for. It was at this time I made the decision to continue the work of my predecessors and join the movement. Solidarity! I have been teaching in beautiful Yarrabah for six years. I first became a QTU Rep at Albany Hills State School in 2010. I became an Area Council Delegate to gain more industrial knowledge and to continue to raise issues, find solutions and seek changes that create better schools at a regional level. I believe that the QTU’s participation in the Fair Funding Now Campaign is by far the most important issue for my school as it aims to address the inequity within education funding. 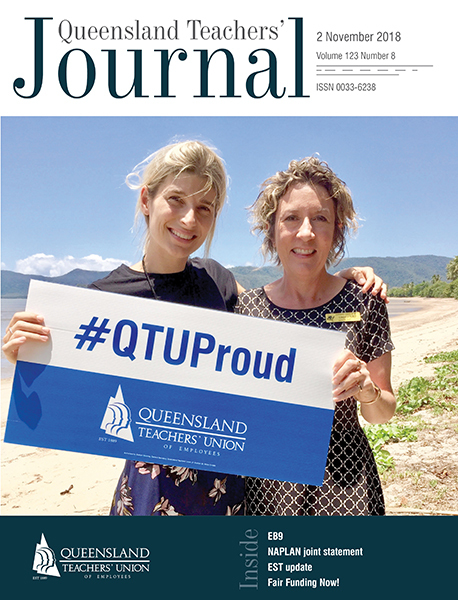 By building a connection between members and the purpose of the QTU through facilitating strong consultation practices allows teachers to have a voice about their profession, school and work conditions. I'm an experienced senior teacher and Lead Union Rep at Tully SHS, President of Peninsula Area Council and State Council delegate for Cassowary Coast. I joined the QTU in my first year, but it wasn't until my second year that I fully appreciated their help. I was thrown into the deep end - acting HoD with two beginning teachers in the faculty. with the QTU's help, I was able to ensure that my staff were supported and their rights at work upheld. Working in far north Queensland, I advocate for a better deal for our rural schools and students, so Fair Funding Now! is my mantra.